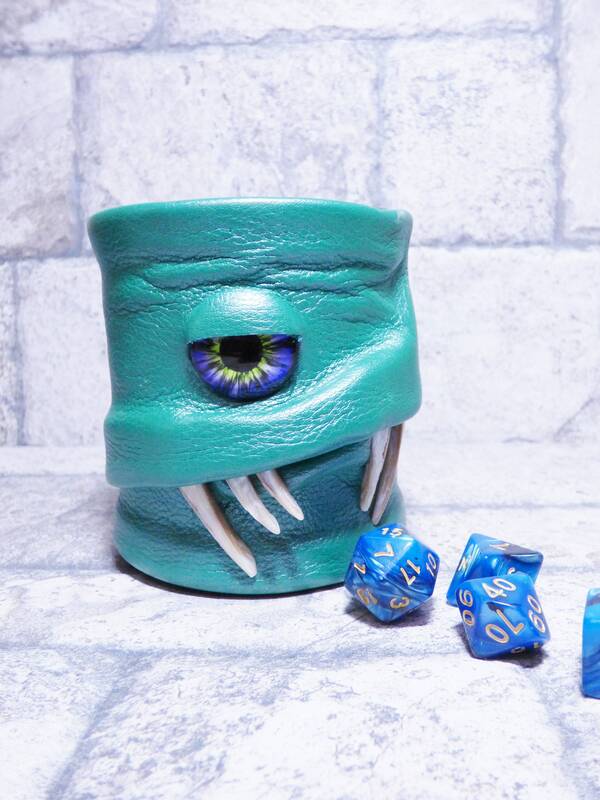 This dice cup is a heavy duty plastic cup completely covered in premium leather wrinkled and crinkled in all the right places, Each one is lined inside and a One of a Kind! He is round and 3 1/4 inches across x 3 3/4 inches tall. The perfect comfort fit for gaming in any world!! He also makes a great pencil cup or desk accessory for all your small needful items. All my original pieces are signed by...me, Pippenwyck! I hope you like this creature!! There are many interesting things here so come visit often. You never know what you might find... Or what might find YOU!!!! Long ago this creature was known as a Dungeon Master of great renown. Until he was caught cheating!! A Wizard was so enraged he cast an unbreakable enchantment turning the Dungeon Master into this dice/pencil cup forever bound to the game and forever reminded of his dastardly deeds!! Now he has been brought to our world for safekeeping as darker forces are gathering in other dimensions. Have you a place for such a creature? Can you keep the Dungeon Master's enchantment intact? Dice And Pencils Not included.